Piston forming the lower part of the combustion chamber: The diesel engine is a type of internal combustion engine which ignites the fuel by injecting it into hot, high-pressure air in a combustion chamber. In common with all internal combustion engines the diesel engine operates with a fixed sequence of events, which may be achieved either in four strokes or two, a stroke being the travel of the piston between its extreme points. Each stroke is accomplished in half a revolution of the crankshaft. Piston forms the lower part of the combustion chamber. It seals the cylinder and transmits the gas pressure to the connecting rod. The piston absorbs heat of combustion and this heat must be conducted away if the metal temperature is to kept in safe limits. The Piston comprises of two pieces; the crown and the skirt. The crown is subject to the high temperatures in the combustion space and the surface is liable to be eroded/burnt away. For this reason the material from which the crown is made must be able to maintain its strength and resist corrosion at high temperatures. Steel, alloyed with chromium and molybdenum is used, and some pistons have a special alloy welded onto the hottest part of the crown to try and reduce the erosion caused by the burning fuel. The crown also carries the 4 or 5 piston ring grooves which may be chrome plated. The cast iron skirt acts as a guide within the cylinder liner. 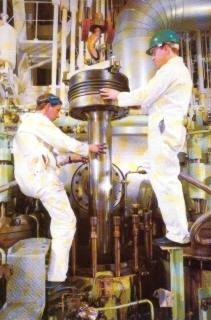 It is only a short skirt on engines with an exhaust valve (known as uniflow scavenged engines), as unlike a trunk piston engine, no side thrust is transmitted to the liner (that's the job of the crosshead guides). The thermal stresses set up in a piston are caused by the different temperature across a section.The free expansion of the hot side is restricted by the cooler surface of the piston. 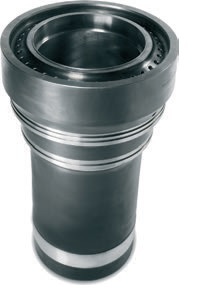 Maximum safe temperature at the three most critical zones for alluminium-alloy piston are Crown 370 degree to 400 degree C. Top ring groove and gudgeon pin bosses 200 degree to 220 degree C.
For medium and high speed engines the weight of the material becomes important to reduce the stresses on the rotating parts. The high thermal conductivity of aluminium alloys allied to its low weight makes this an ideal material. To keep thermal stresses to a reasonable level cooling pipes may be cast into prevent distortion. The coolant used for removing and conveying the heat from a piston may be either fresh water, distilled water or lubricating oil. Water has the ability to remove more heat than lubricating oil ( specific heat of water approximately 4 and lubricating oil 2 and temperature difference 14 deg C for water and 10 deg C for lube oil) . The efficiency of the engine depends upon the effective sealing between the piston and liners. Leakage will reduced compression pressure and power will lost. Piston rings seal the gas space by expanding outwards due to the gas pressure acting behind them. They also spread the lubricating oil up and down the cylinder liner and transfer heat to the liner walls Three to six power or compression rings are fitted to the piston, the number depending on weather the engine operates on the 2-stroke or 4-stroke cycle. 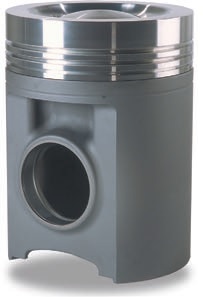 Piston forms the lower part of the combustion chamber in a marine diesel engine. It seals the cylinder and transmits the gas pressure to the connecting rod. i) Piston seizure; all too often followed by an explosion of the lubricating oil – air mixture in the crankcase. ii) Cracking of piston crown and side walls, due to cyclic variation of pressure stress superimposed on stress due to temperature gradient. most common reasons of Piston running hot : i) Inadequate circulation of cooling media and or supply not sufficient. ii) Excessive deposit in cooling space (scale or carbon). iii) Lubrication not sufficient.